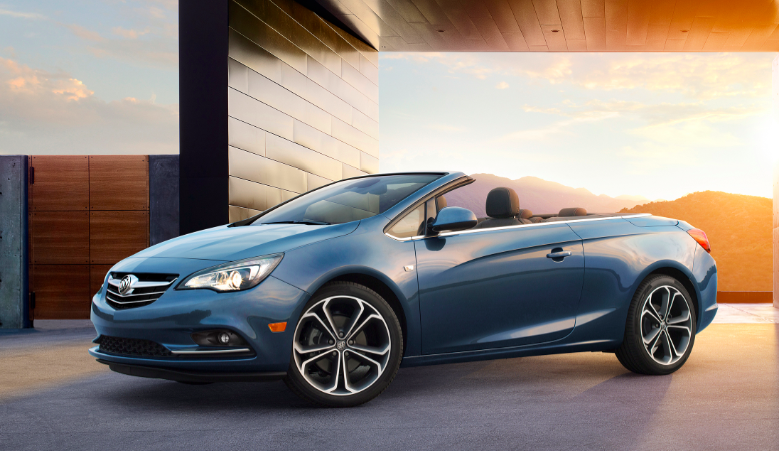 When it goes on sale in February, the Cascada will be the first convertible to grace Buick showrooms in nearly a quarter of a century. So why would the company return to a market it had long since abandoned? There are a couple of reasons. First, Buick is trying to attract a younger audience, and the company feels a convertible is a good way to do that. Second, the past couple of years have seen the demise of three would-be competitors in the Chrysler 200 convertible, the Volkswagen Eos, and the Volvo C70, all front-wheel-drive four-seaters like the Cascada. Combined, that trio accounted for roughly 17,000 annual sales, which leaves a hole Buick feels the Cascada perfectly fills. Furthermore, the Cascada is already sold in Europe as an Opel and in Australia as a Holden, and though Buick claims more than 500 parts were changed to meet American requirements and tastes, that’s a whole lot less than having to start from scratch. And the company has a point. But that doesn’t mean the Cascada is devoid of convertible competition. At the low end of the convertible market lies smaller entries such as the tiny Smart ForTwo, the only slightly larger Fiat 500, and the two-seat Mazda Miata sports car. Up from there are four-seat ponycars, the venerable Ford Mustang and the soon-to-return Chevrolet Camaro, both of which are rear-drive vehicles that have limited appeal in the snow states. Furthermore, while the Mustang starts at about $31,000, one can quickly close in on $40,000 with popular options. Closer in concept and prestige to the Cascada are the Audi A3 Cabriolet and BMW 228i convertible, which start at about $38,000 and $40,000 respectively. However, bottom lines likewise inflate rapidly as popular options are added. As the Cascada starts at $33,900 (including destination) for the well-equipped base model and $36,990 for the loaded top-line Premium – neither of which offer any options – it stands as a relative bargain in the ragtop arena. One notable styling element of the Cascada is that the taillights are uninterrupted with a trunklid cut line, giving the car a wider, cleaner look from the rear. Since regulations state that the taillights need to be visible with the trunklid open, smaller, duplicate taillights are mounted in the body underneath the trunklid–one of numerous changes made to adapt the car to the U.S. market. So the Cascada certainly makes a strong value proposition. But does it make a strong convertible? That’s what we traveled to Florida to find out. First, let’s put the Cascada into perspective. At 184.9 inches stem-to-stern, it’s in the compact-size category – not surprising, as it’s built on the same platform as Buick’s Verano compact sedan – but is about 10 inches longer than the Audi and BMW. While convertibles in this class formerly trended toward retractable hardtops (as all the Cascada’s now-defunct competitors offered), Buick chose to go the soft-top route, as is the case with all current rivals. Buick says that’s at least partially due to style, as the soft top makes it more recognizable as a convertible when the lid is closed. 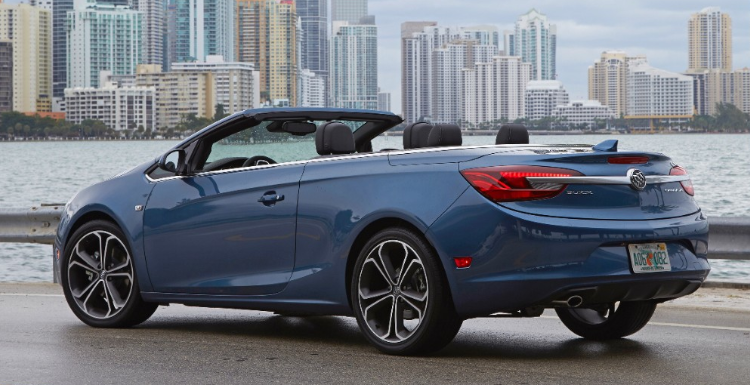 According to Buick, the Cascada’s can go up or down in 17 seconds by activating a single button at speeds up to 31 mph, and indeed, we found that to be the case. The Cascada’s lone engine offering is a 200-horsepower 1.6-liter turbocharged four that’s unique to this vehicle, at least in the U.S. In terms of power output, that places it between similar engines offered in the Audi (170 hp) and BMW (240 hp). A 6-speed automatic is used in the Buick and Audi, an 8-speed in the BMW, which is also available with a 6-speed manual. Cascada and the Audi come with front-wheel drive, the BMW with rear-wheel drive, though both German cars offer an all-wheel-drive option that’s absent on the Buick. Although the cockpit looks very subdued in all black (shown), two-tone color choices are offered that brighten things considerably. Controls are mostly handy, though the recessed touchscreen is a bit awkward to reach and use. The base Cascada comes with all the features expected of a modern luxury-brand car, including a 7-inch touchscreen with text messaging and Siri Eyes Free, a navigation system, a rearview camera, leather upholstery, heated front seats, and dual-zone climate control. It also has less-expected features such as 20-inch alloy wheels, rear park assist, heated steering wheel, 4G LTE WiFi hotspot, and rear “rollover bars” that pop up automatically if sensors detect the car may roll over. Note that many of those features – even some of the “expected” ones – are optional on its rivals. 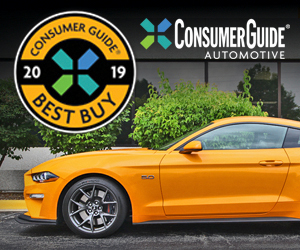 Added on the Premium are mostly high-tech items, including forward collision alert, lane-departure warning, automatic headlights, front park assist, and rain-sensing wipers. Inside, there’s adequate front headroom and legroom even for fairly tall adults. It’s tighter in back, where top-up headroom might come up short for riders much over 5’10, and those folks wouldn’t have enough knee room if someone much taller than that is in the seat ahead. However, getting back there is simplified by the fact the front seats power forward far enough to create a decent-size opening. But what’s really neat is that when they power back, they go until they hit the rider’s knees, then automatically power forward an inch or two. Another nicety is that when the door is closed, the shoulder belt is “presented” to the driver and front passenger on an extendable arm, which is much easier than having to reach far back to grab it. Interior materials match the price, with the padded dash, door tops, and armrests being augmented by nice-looking plastics. Subtle silver accents don’t do much to brighten what is a rather bland-looking cockpit in solid black, but two-tone color combinations are available that liven things up a bit. After the door is closed, an “arm” automatically extends to move the shoulder belt to a more accessible position, and then retracts after it’s buckled–a very handy feature. 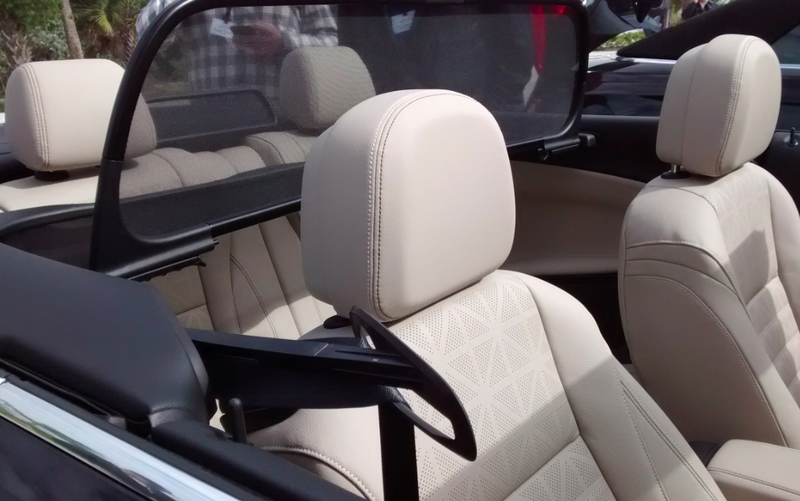 The mesh windscreen shown folds in half and can be stored in a bag behind the rear seat. Thus it’s a bit of a chore to deploy, but it does somewhat reduce wind buffeting and noise. Visibility is just OK to the front corners, as the Cascada’s inverted Y-shaped pillars are quite wide at the junction of the two posts. There are no center pillars (just a strip of sealing between the front and back windows when they’re raised), so the over-the-shoulder view is fine. With the top up, rear-corner visibility is – typically for a soft-top convertible – quite bad, making the standard rearview camera a blessing when backing. Unfortunately, it doesn’t do anything when going forward, and the rear window is but a narrow slit. It’s worth noting that the windshield – though steeply raked – is far enough forward that it allows even shorter drivers to see sky overhead while traveling down the road with the top lowered. The audio system includes a number of conventional dashboard buttons that are easy to reach, but some adjustments require going through the touchscreen, which is a long stretch away. Furthermore, some virtual buttons along the bottom of the screen are difficult to hit, particularly on less-than-smooth roads. There are also some duplicate buttons on the steering wheel. Climate controls are handy, and consist of rotary knobs for temperature, individual buttons for mode, and repetitive-step buttons for fan speed. While there are a useful number of interior storage cubbies, none are very large. There’s a modest-size glovebox and console box, a small forward console bin with USB/Aux/12-volt plugs, two console cupholders, a left-side flip-down dash bin, and small map pockets with bottle holders in the doors. 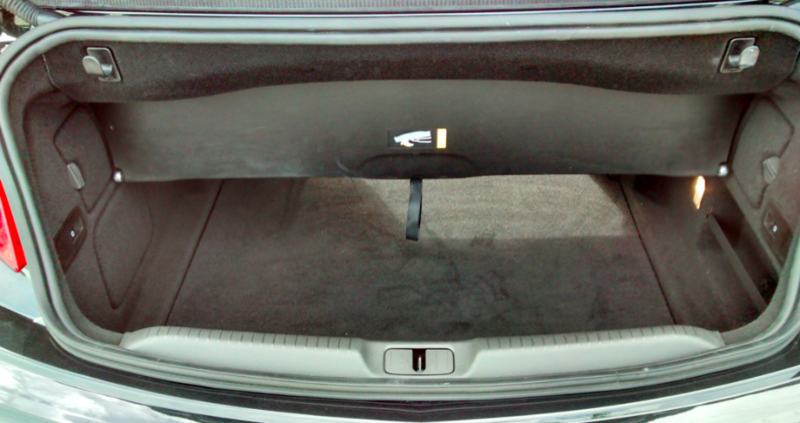 A partition (with strap hanging down) can be lowered to indicate where the top will reside when folded so that you don’t overfill the trunk when the top is up. However, it restricts the otherwise good-sized pass-through opening to the rear seat. As the trunk is too narrow to fit a set of golf clubs sideways, you have to fold the rear seat backs to carry them lengthwise, and they probably can’t be slid forward with the partition down. Our preview drive started in Key West, Florida, and ended in Miami. There were few rough roads or fast curves along the route, but the Cascada seemed to offer a fine ride/handling balance. Crossing railroad tracks prompted just a bit of cowl shake (noticeable mostly in a slight movement of the rearview mirror), but the structure generally felt quite solid. Noise levels are low top-up (Buick made particular note of how well the top is insulated), and reasonably low with the top down, as conversation required just a little more volume than with the cabin enclosed. There’s a folding mesh windbreak panel (intended to reduce both buffeting and noise) that fits into a bag behind the rear seat, but it takes some work to put it in place, and the one on our test car sometimes flopped down in an admittedly stiff crosswind. The engine is also quiet, producing just a muted whine under full acceleration. Speaking of acceleration, the Cascada’s is more than adequate, if not exactly racy. Nail the gas from a stop, and the car moves away with a turbo-typical “gentlemanly” launch, followed about 10 feet out by a stronger surge. Buick says the 0-60-mph sprint takes a believable 8.6 seconds, and we found the transmission kicks down fairly quickly for more passing power. While there’s a question whether Buick can sell enough Cascada’s to make a positive impact on the company’s bottom line, there’s little question it will add some needed allure to Buick showrooms. There’s also little question that those who buy it will have purchased a reasonably practical four-season convertible that offers good driving dynamics and a host of neat features at a relatively bargain price. 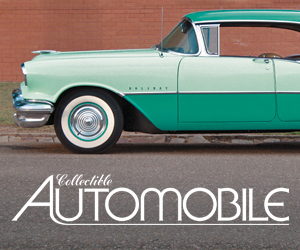 All of which gives strong support for the “Prodigal Son” return of a stylish Buick ragtop. Written by: Rick Cotta on January 28, 2016.on February 14, 2018.